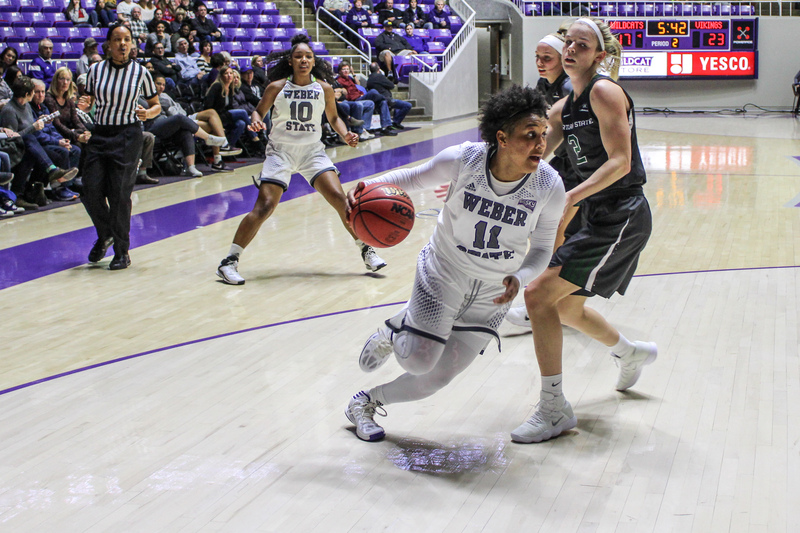 On paper, this matchup between Portland State and Weber State looked like it was going to be a battle as Portland came in one game behind Weber State in the Big Sky standings. 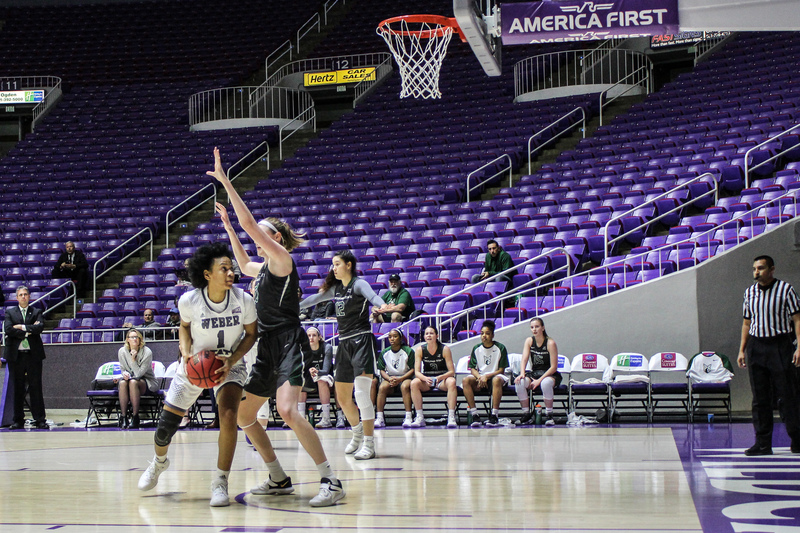 The Wildcats got off to a solid start offensively, hitting three 3-pointers, two from Kailie Quinn, who didn’t miss a shot in the first quarter. Portland guard Sidney Reilly led all scorers with seven points, and she carried that momentum into the second quarter as the Vikings started out on an 8-0 run to start the second. The Wildcats struggled to get anything going early in the second, not hitting anything in the first five minutes. However, as they stepped up their defensive intensity, that 8-0 Viking run was followed by a near five-minute dry spell, which got the Wildcats back in game. Weber State finished the half shooting 8-37, but still only trailed by one point. When the shots aren’t falling, the players have to figure out other ways to help the team, and that’s what Jocelyn Adams and Larryn Brooks did in that first half. Adams finished the half with 10 rebounds, and Brooks filled out the stat sheet finishing the first half with three points, six rebounds, three assists and two steals. Shiann Johnson goes for a 3-point shot during the game against Portland on Feb 15. After making some halftime adjustments, it was clear that the Wildcats were a lot calmer, especially on the offensive end, getting two quick baskets from Adams to start the second half. 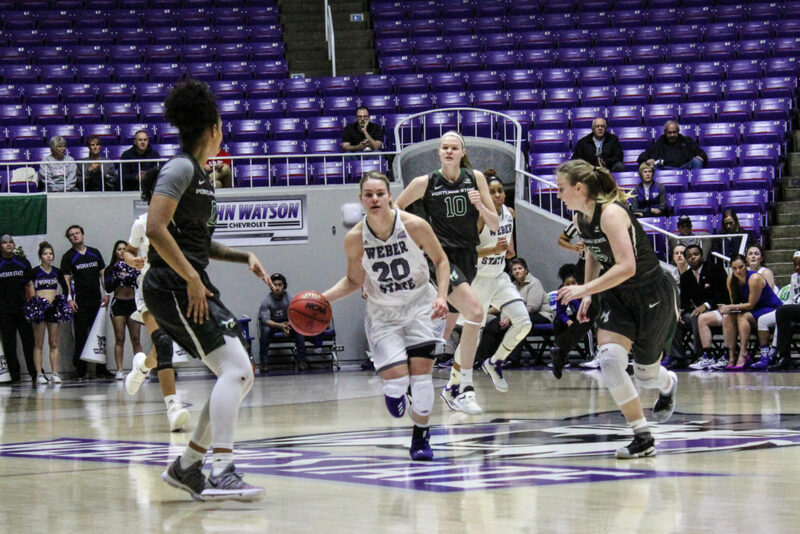 The Wildcats owned the offensive glass in the third quarter, which led to more scoring opportunities and eventually a three point lead heading into the final quarter. However, the Wildcats found themselves in a dog fight, down by three with 10 seconds to go. 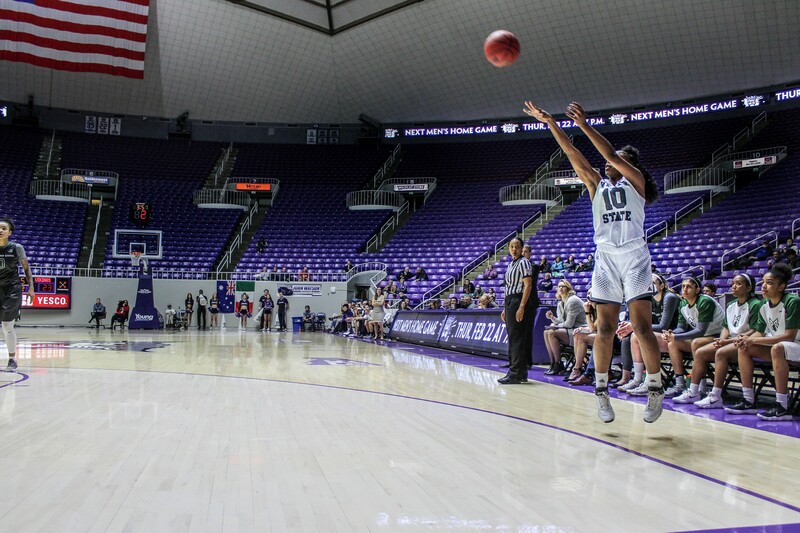 Despite a poor shooting night, Larryn Brooks, with confidence, took one dribble on the right wing and launched a leaning 3-pointer off of her right foot and tied the game at 60 as the crowd erupted. With one possession left for the Vikings, Kiana Brown, one of three players in double figures for the Vikings, drove right and got a nice layup to fall and seal the game with only 1.2 seconds left. 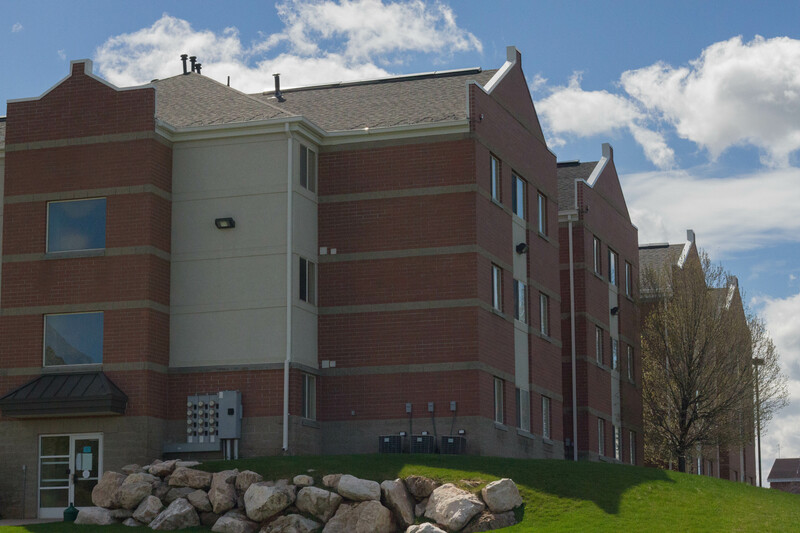 “We had a lot of opportunities, they just weren’t falling,” Ord said. Jocelyn Adams finished the game with nine points and 16 rebounds, one short of her career high. “I know my roll and my main focus, which is rebounding, and that’s what I think I help this team with the most. So I try my best to come with that same energy every game,” Adams said. Kailie Quinn led all scorers with 19 points and cashed in 5-9 from the 3-point line. 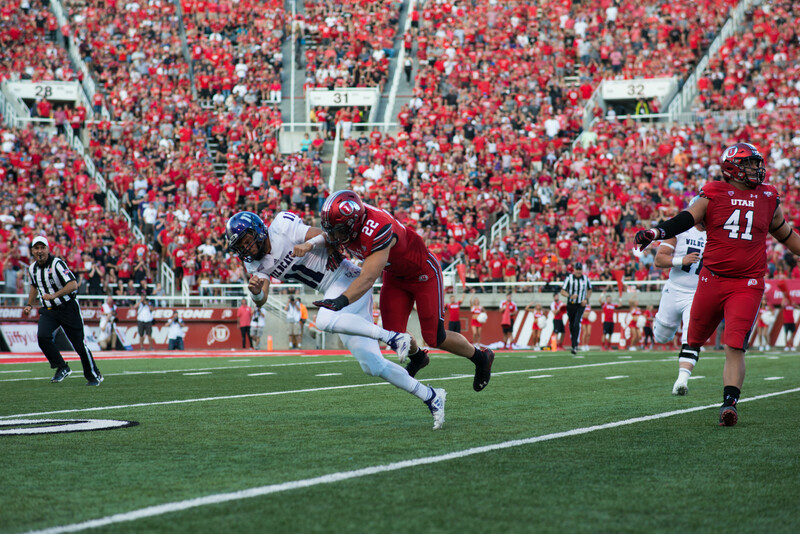 This 60-62 battle, which contained 11 lead changes, left both teams at 8-5 in the Big Sky conference. 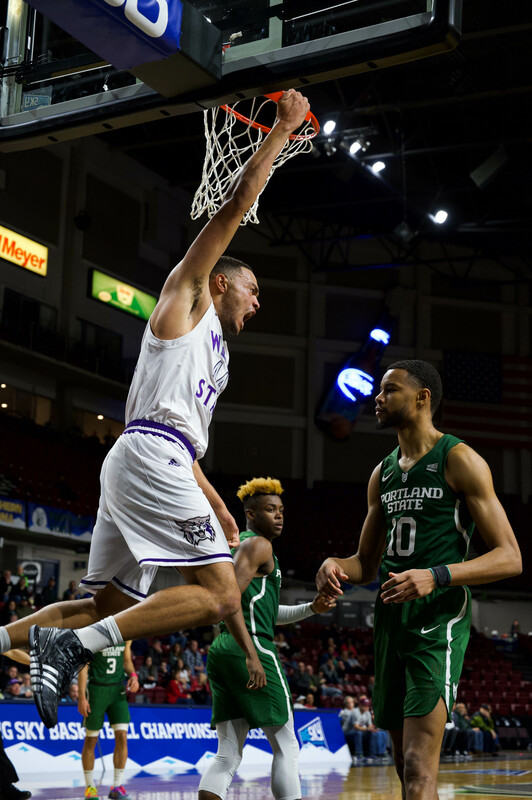 The Wildcats will look to turn this offensive slump around for their next game against Sacramento State, Feb. 17 at 2 p.m.